Kroeker, an assistant professor of ecology and evolutionary biology, was chosen for the award by the UC Santa Cruz Sustainability Office and the Academic Senate's Committee on Research. She will receive $25,000 to fund the activities outlined in her proposal, as well as $6,000 to host a Carbon Neutrality Fellow, who will work with the Sustainability Office to support faculty and student engagement in climate action. Kroeker's proposal includes plans to expand her research on the ecological effects of climate change and ocean acidification to include the potential repercussions of these changes on human health. One concern is that increased temperatures and other effects of climate change in estuaries and coastal waters could lead to an increase in the prevalence of waterborne infectious diseases, such as cholera. Kroeker will convene a working group of scientists to study these issues and to look into whether the spread of infectious diseases in coastal waters can be reduced through nature-based strategies, such conservation and restoration of seagrass beds and other marine ecosystems. "My research is motivated by a desire to improve our ability to forecast and manage the emergent ecological effects of environmental change in coastal ecosystems, as well as to develop actionable solutions," she said. A novel outreach program planned in conjunction with this research will target local high school students. 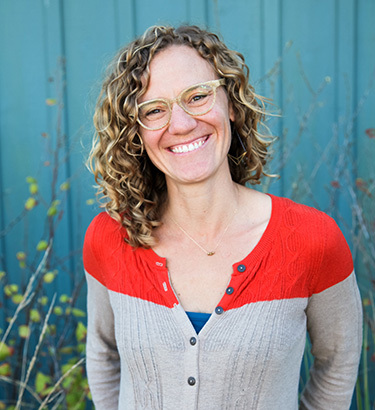 Kroeker will train undergraduate and graduate students in climate change communication and outreach, and she will visit high school science classes with her students to give short presentations on climate change, ocean acidification, and human health. They will also produce videos on these issues to be hosted on a Coastal Sustainability Blog and used together with activities for high school students related to climate change action and science careers. Kroeker said she expects the outreach program and blog to extend beyond the tenure of her one-year award as Climate Action Champion. She also plans to organize a panel discussion on the links between climate change and human health. The panel will include members of the scientific working group and will be open to all students and the public. In addition, Kroeker will be developing two graduate courses as part of the core curriculum for the proposed Coastal Sustainability Graduate Program. "Facilitating Change" will be a skills-based course in effective leadership and management, focusing on the skills needed for stakeholder engagement, conflict resolution, team building, and project management. "Adaptation and Planning in a Changing Climate" will be a project-based course in which students will work with a local organization, agency, or group to address a real-world problem related to climate change. Kroeker has been a leader in solutions-based climate change science and planning, working with international organizations such as the World Bank and the Nature Conservancy, briefing Congress on the potential effects of ocean acidification, and engaging in local planning for climate adaptation in the Central California Marine Sanctuaries. The Faculty Climate Action Champion Award promotes faculty innovation and leadership in climate change research, teaching, and engagement. The award was developed through the UC Office of the President's Global Climate Leadership Council to support UC's Carbon Neutrality Initiative.